Want an entire summer of kid-friendly, boredom-busting craft ideas? Read on for 10 weeks of DIY ideas to keep little hands busy and inspire creativity for the best summer ever! We've made it easy for Mom and Dad, too: all you need to get started are our Essential Summer Kids Craft Supplies, everyday items you’ll likely have on hand at home and a few inexpensive surfaces from your local specialty retailer. Get the Craft Supplies Shopping List and full step-by-step instructions for all 10 weeks of DIYs below. Get the entire assortment of essential kids craft supplies for under $25 to use all summer long! ... For a total of $24.46! 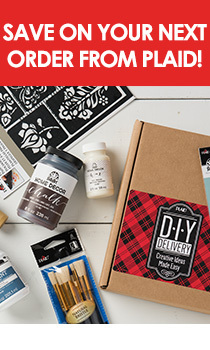 You'll find all the supplies you need at your local speciality retailer or on Plaid Online. Start with the summer essentials craft supply shopping list and make a new craft every week! Blast off into the holiday weekend with shipping tubes-turned-fireworks! Have the kids make several and use them as party centerpieces for your cookout. Put all those paper plates left over from last week’s cookout to good use! Make this interactive game for an afternoon of smiles. Scout the recycling bin for empty cereal or food boxes and help your little prince or princess create their own magical kingdom! This updated take on the traditional summer kids camp craft is so cool! Color and pattern combinations are endless in these fun keychains, and the festive tassel finishes 'em off with flair. These keychains turned out so adorable - be sure to get extra supplies so adults can join in on the fun! Repurpose that rock collection from your mid-summer nature hike into something special. This sweet little turtle is sure to find a home in your backyard! Give him some friends by painting pebbles to make some mini-turtles, too. Are your kids as captivated by the splish-splashing and fast dashing of the Olympians as we are? Let them channel their inner athlete with a Ring Toss Game as the Summer Olympics Games get underway. We’re loving all the dreamcatchers we’re seeing in home decor - let your little one be their own trendsetter when they craft their own version using sticks! Hang it above their bed for a night of sweet sleep. It's almost time for the next "S" word after summer... school! Create these flashcards to jumpstart the school year. Let little imaginations loose with hand puppets! Make a cast of characters, and let the littles put on a play sure to get a standing ovation. Put all those wood scraps from summer DIY home projects Mom and Dad have been doing to good use! A coat of paint transforms them into a set of blocks full of possibilities. What #summersurvival summer kids craft ideas would you add to our list? Let us know in the comments, and tag your summer crafts with #plaidcrafts to share them with us. Follow Plaid on Instagram for more inspiration!